From the brain that brought you Blocksworld comes a new adventure focused on blocks, Odd Bot Out. 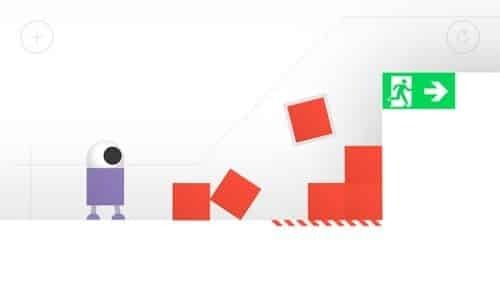 This puzzling mobile journey will take you across a minimalist game world as you help Odd after he fails the standardised robot test. Right from the start you’ll feel attached to your little robot friend after guiding him through the basic tutorial and watching him fail the robot test. While Odd might not have a face to show his emotions you’ll definitely feel his robotic heart break as he gets thrown into the recycle heap which is just the start of your puzzle filled journey. 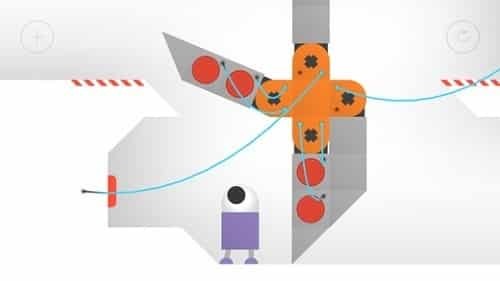 Odd Bot Out splits the game into 100 bite sized levels that each require their own mixture of block building, physics and electricity to reach your end objective. Each level is very unique and does a great job of slowly building on the mechanics you might have encountered in past levels, as a great puzzle game should. These mechanics range from moving Odd around the game world (who can also alter his height slightly as required) from moving blocks around at will and connecting items together to perform a certain function. While this starts as building things like stairs or platforms you’ll quickly be combining half a dozen wheels and electric cables together for more extravagant creations. It’s this level of variety and the delightfully minimalist storyline that will keep you completing level after level to help Odd find his place in the world. While puzzle veterans won’t find that the levels put up too much of a fight and are made up of fairly small objectives the aesthetic of the game more than makes up for this. Odd Bot Out is minimalist, puzzling and intriguing, you’re guaranteed to be hooked. A puzzle adventure for iOS and Android. Minimalist (but impressive) game design. 100 levels to for you to master. Combine blocks and items together to achieve your objective. Great puzzle variety and mechanics that slowly grow with each new level.